If you want to increase the mobile battery lifetime of your 2210 iPAQ just order and carry a spare replacement battery. Having a spare battery allows you to keep one charged up and ready to go whenever you need it. The iPAQ 2210 cradle allows a second battery to be recharged while the iPAQ pocket pc is also charging. 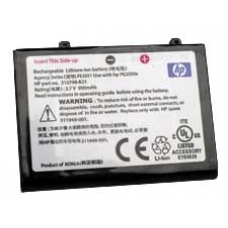 Exact replacement for the following HP battery part numbers 310798-B21, 311949-001, 35H00013-00 and FA110A#AC3. Agency Series PE2051 Use With PE2051, PE2050X The slim replacement / rechargeable / removable Li-Ion Lithium Ion battery is suitable for the whole iPAQ 2200 range.